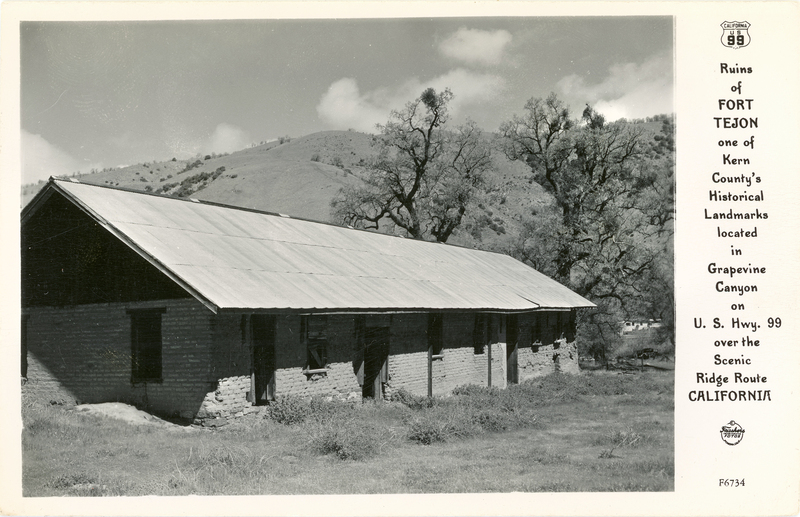 SCVHistory.com LW3276 | Fort Tejon | Ruins of Fort Tejon, 1940s. "Ruins of Fort Tejon, one of Kern County's Historical Landmarks located in Grapevine Canyon on U.S. Hwy. 99 over the Scenic Ridge Route, California." Unused postcard, divided back, published by Frashers Inc. of Pomona, Calif.
No. F6734 in a series. It's the same series as the earlier of two series of Frasher photo postcards of the short-lived Florafaunium in Lebec, which opened in March 1942, so it was probably printed during or soon after 1942. LW3276: 9600 dpi jpeg from original postcard purchased 2018 by Leon Worden.